TRILOK STEEL INDUSTRIES amongst the noticeable names in the industry and most recognized Stainless Steel U Tube Supplier.We supply these U bend stainless steel tubein different sizes, shapes and designs as per clients’ specifications at reasonable price.Our Stainless Steel U Bend Tube is manufactured to specification to ensure that your end-use product requirements have been met. We are supplier, stockist and distributor of Stainless steel Seamless U Tube and Stainless Steel Welded U Tube.Trilok Steel Industries has earned the status of preferred Stainless Steel U Tube manufacturer in India. We are well known exporter, dealer and trader of U Tubein a number of standard sizes and grades, including 304/304Land 316/316L.Buy SS U Tubeat best price in India. 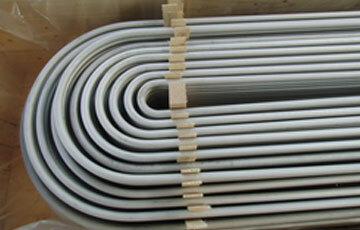 Stainless Steel U Tube Length As per Customer requirement, Maximum upto 22 Meter Long. Stainless Steel U Tube Finishing It can be supplied in mechanical polished with various grits like at 80, 120, 240, 320, 400, 600 grits and mirror polished. TRILOK STEEL INDUSTRIES supplied Stainless Steel U Tube as hot rolled or cold drawn. The manufacturing of SS U Bend Tubebending equipment that is used exclusively for stainless tube bending as per drawing & specification given by customer. Stainless Steel Seamless U Tubesare widely used in Heat Exchanger Systems. SS U Tubes are available in various and also in custom-made sizes and shapes at affordable rates to our esteemed clients.Welded Stainless Steel U tube is essential in strategically important and critical fields -Nuclear And Petrochemical Machine Building We currently supply into the world’s most prestigious Architectural, marine, and construction projects.We can customize the ideal Stainless Steel U Tubingfor your unique application. U-tubeheat exchangers Designed for high temperature applications, especially steam condensing or hot oil systems. Thïs model is selected when differential expansion makes a fixed tube sheet exchanger unsuitable and when conditions preclude a floating head type (HPF) selection. Contact to Trilok Steel Industries for confirm availability and pricing. As a largest stockist we have huge inventory of Stainless Steel U Tube include Stainless Steel 304 U Tube, Stainless Steel 304L U Tube,Stainless Steel 316 U Tube,Stainless steel 316L U Tube and stainless Steel 201 U Tube. 'U' Bend Stainless Steel Tubes are manufactured in Trilok Steel Industries as per the customer requirements. Bends can be Heat Treated in accordance with Clients' requirements followed by hydrostatic testing and dye penetrant testing if required. 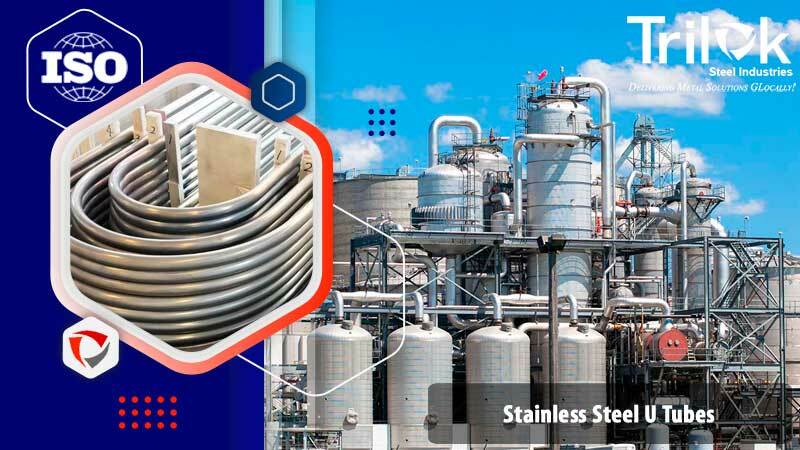 Heat exchanger equipment on the basis of stainless U-tube is essential in strategically important and critical fields nuclear and petrochemical machine building. check latest updated price of Stainless Steel U Tube. Stainless Steel Seamless U Tubing, Steel U Tube, SS U Tube Dealer in India, High Quality Stainless Steel U Tube, Stainless Steel U Tubes Exporter in India, U Stainless Steel Tube Exporter, Seamless Stainless Steel U Tubes. Suppliers of Stainless Steel U Tubes, 304 U Steel Tubes, Stainless Steel U Tube Exporter in India, SS 304L U Tube , SS 316 U Tube Supplier in Mumbai, India. Stainless Steel U Tubes are finished in accordance with customer needs regarding dimensional and wall thickness specifications as well as heat treatment for more demanding applications. In general a Stainless Steel U Tube is manufactured according to current standards API, ASTM, and ASME. If required for special projects we can also supply large diameter U Tubes. The dimensions for heat exchanger tubesin special grades may differ from the above,please contact us.